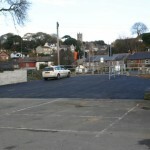 `Helston, Cornwall, Cattle Market opened a new section on Monday for attested cattle. So ended one era and began another. 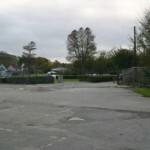 No longer would Anderton and Rowlands with their scenic gondolas and later Golden Dragons , be able to occupy the whole Lower Green for their annual visit to attend for Flora day arrangements, which they had done regularly for many past years. 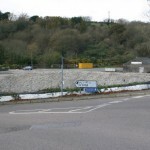 The new market of Helston in the early stages of its 50 years. 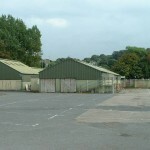 Note the three large cattle sheds still under construction. 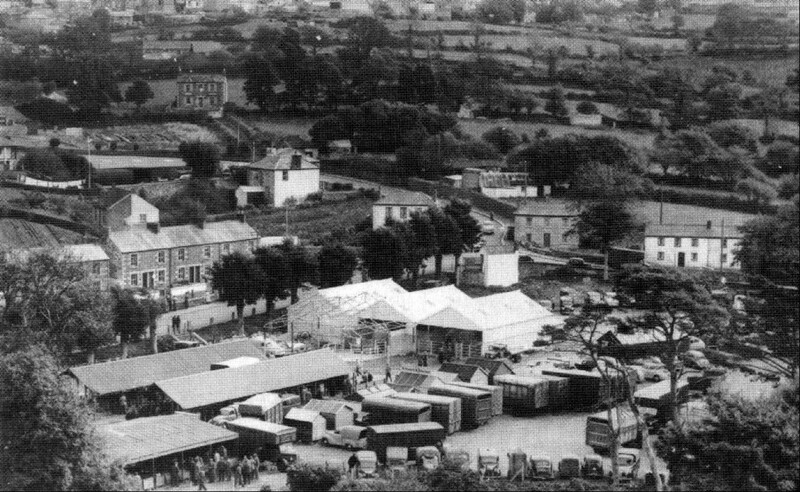 So, as the Cattle Market buildings have recently been demolished`, I would like to take a look back at what I saw as a youngster in Helston in the 1960`s & 1970`s. As a child I remember being taken to market on numerous occasions. In particular I thought it was a dangerous place for a small boy and so I always took special care not to stray away from from either my Grandad, William Frederick, or my father Fred. Looking back to those Mondays in the 60`s & 70`s there would always be hundreds of cows and pigs for sale. It seems silly really looking back on it but I just can`t remember there being any sheep. I`m sure there was but I just can`t picture them. What I can still remember very vividly about those Monday mornings are the many cattle lorries with there big iron & wooden tail gates. 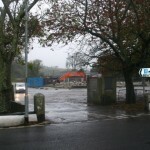 The lorries would back up to the unloading gates of the market or to the concrete `slipways` and then the gate would be dropped. When I say `dropped` I mean `dropped`. `Bang`, down would come the tail gate and then someone would rush forward to open the inner wooden gates to let the cattle down to the pens. Sometimes the cattle would come out without any coercing but other times some brute of a farmer would be in there hitting them hard with a stick! There were so many vehicles of all shapes and descriptions, from cattle lorries to ice cream vans! 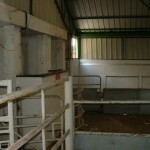 The whole of the cattle market would be overflowing with the `goings on` on each Monday morning. 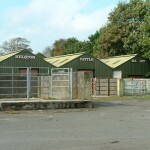 If you were brave enough to venture into the selling shed you would be met by the `bellows` of the auctioneer. I`m sure the farmers understood what was going on but to me as a small lad they were shouting in some kind of foreign language. As soon as one cow had been paraded around the circular ring or `stall` and sold on, another would be forced in through the huge iron gates and the process repeated. And so it went on until all were sold. Outside farmers were busy discussing life with others or busy waiting for payment from the auctioneers. 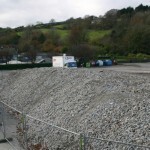 Others would be cleaning out the seemingly endless `mountains` of `muck` from the backs of the lorries. Up at the northern end of the market a small building containing a water pump would be working `overtime` lifting water a few feet up from the River Cober so that the farmers could `hose down` the vehicles. 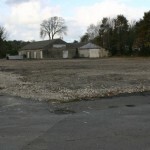 The local council employees would have the unenviable task of cleaning up the market buildings, stalls and the market area. I`ve no idea what happened to all this `muck` but I`m sure many of the towns inhabitants took the stuff for their gardens! And so 50 years of the New Cattle Market has come to an end. No more will you see the Monday morning `goings on` at the bottom of the town. 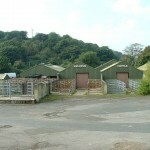 View of the Cattle Market pens looking towards the Coronation Lake. 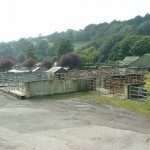 Another view of the pens and the front of the Market. 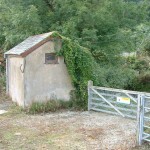 Rear of the Cattle sheds with entrances boarded to prevent vandalism. 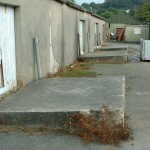 One of the large unloading ramps in the market. 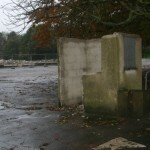 This example is at the northern end near the pumping station. 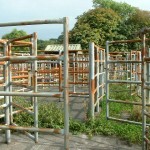 Rusty cattle pens awaiting demolition. 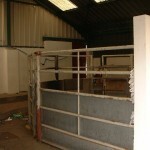 Auctioneers `podium` inside the cattle shed with the circular selling `stall`or pen. 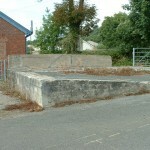 Another view of the auctioneers `pen`. Mechanical digger busy at work inside the market. 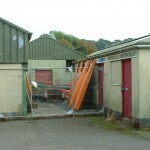 50 years of Helston`s history gone in a few hours. Entrance Hut minus it`s roof! 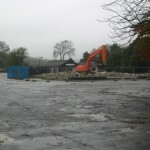 Not much left at this stage! 16TH NOVEMBER 2005 NOW YOU SEE IT, NOW YOU DON`T! 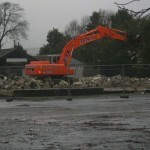 Goodbye to the Cattle Market Toilet Block! 16TH NOVEMBER 2005 Looking across to where the Cattle Sheds stood. 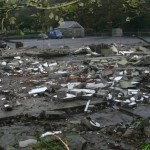 Now just a large pile of rubble! 16TH NOVEMBER 2005 Take a last look at the Boating Lake Cafe in the background of this photo. It`s next on the destruction list! 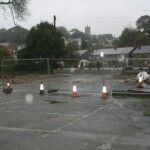 16TH NOVEMBER 2005 Constructing a new pedestrian entrance at the `Wincanton` end of the market. 16TH NOVEMBER 2005 The finished entrance complete with traffic lights.